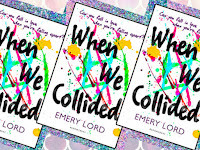 This month's episode features Cove members Roberta and Millenia discussing the October 2017 Cove pick, WHEN WE COLLIDED by Emery Lord—Cove Pick #203! ✘✘✘ Have you read WHEN WE COLLIDED? What was your experience of the book? Do you agree or disagree with our thoughts? Comment below and let us know what you think! *Spoilers abound. Podcast is for those who've read the book.